Deric's MindBlog: Emotion is a component of the earliest stages of perception. Emotion is a component of the earliest stages of perception. Emotions and perceptions are generally assumed to be separate and parallel realms of the mind. Topolinski et al. show to the contrary that affect is a genuine online-component of perception, instantaneously mirroring the success of different perceptual stages. Here is their abstract, following by a graphic of the impossible Necker cube used in experiments 4 and 5. Current theories assume that perception and affect are separate realms of the mind. In contrast, we argue that affect is a genuine online-component of perception instantaneously mirroring the success of different perceptual stages. Consequently, we predicted that the success (or failure) of even very early and cognitively encapsulated basic visual processing steps would trigger immediate positive (or negative) affective responses. To test this assumption, simple visual stimuli that either allowed or obstructed early visual processing stages without participants being aware of this were presented briefly. Across 5 experiments, we found more positive affective responses to stimuli that allowed rather than obstructed Gestalt completion at certain early visual stages (Experiments 1–3; briefest presentation 100 ms with post-mask), and visual disambiguation in possible vs. impossible Necker cubes (Experiments 4 and 5; briefest presentation 100 ms with post-mask). This effect was observed both on verbal preference ratings (Experiments 1, 2, and 4) and as facial muscle responses occurring within 2–4 s after stimulus onset (zygomaticus activity; Experiments 3 and 7). For instance, in participants unaware of spatial possibility we found affective discrimination between possible and impossible Necker cubes (the famous Freemish Crate) for 100 ms presentation timings, although a conscious discrimination took more than 2000 ms (Experiment 4). The Freemish Crate (impossible Necker Cube) which features inconsistent mutual occlusions of some of the lines constituting the cube and thus represents a cube that cannot exist in three dimensions. Such an impossible cube renders visual disambiguation impossible. 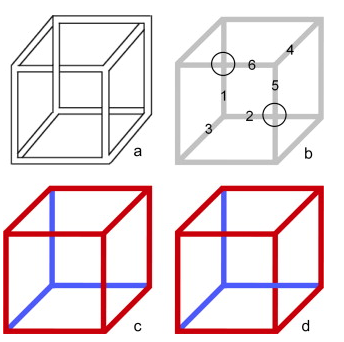 (a), the visual manipulation from Experiments 4 and 5 (b), examples of a possible (c), and an impossible Necker cube (d).